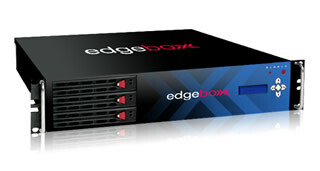 The edgeBOX Enterprise model supports up to 300 users for the larger corporate environment. Along with the full range of edgeBOX services it comes with hot-swappable redundant disks and dual power supply for increased robustness and resilience. The 2U form factor is ideal for mounting in a rack. © Copyright 2013 by Critical Links Inc. All Rights Reserved.